This term our topic is the 'Marvellous Mayans'. We will be looking at the Ancient Mayan tribe and researching some of the things that they invented. We will also be looking at similarities between how they lived and how we live today. Over the last two weeks, the children have been looking at explanation texts. They have been looking at the features and how they are structured. The children researched and made a planning skeleton about how chocolate is made. They then wrote their own explanation text on it. They even came up with some ideas to create their own new type of chocolate bar. In maths, Year 5 have just finished working on word problems and Year 6 have finished their chapter on fractions. The children have started to paint their Mayan Masks and are now ready to add in the final detail to make their masks unique to them. 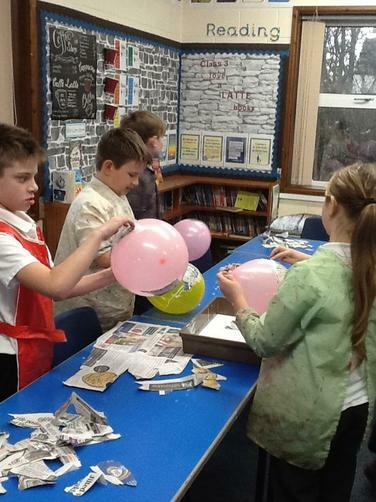 The children are also busy planning and preparing for our wow event to showcase what they have learnt about the Mayans. This week in Literacy, the children finished off their newspaper reports about a Mayan discovery. They edited their draft version and published their final report. In Maths, Year 5 have been have moved on to dividing a 4 digit number by a 1 digit number. They have been linking this to their times tables knowledge. Year 6 have been adding and subtracting fractions, finding the lowest common denominator to do this. 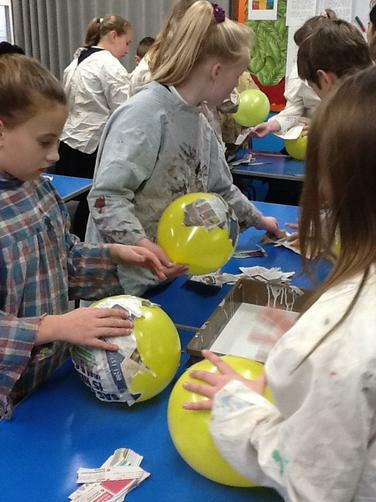 In topic, the children began to make their Mayan Masks. 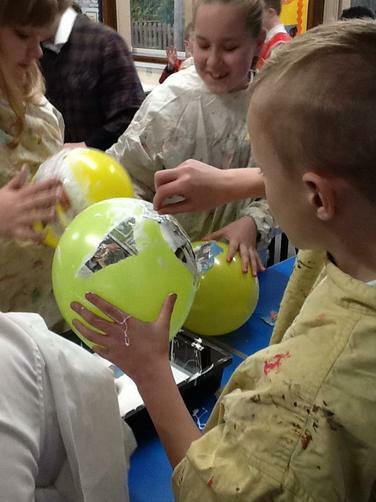 They started to put the first few layers of Papier Mache on them – it got very messy!! The week started off with a visit from Pudsey Bear. We then held the Bring and Buy and Cake sales. Over £300 was raised in total. So a great effort from the class. 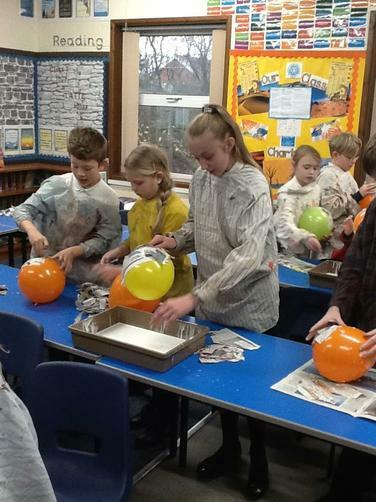 In Literacy, the children were given the cold task of writing a newspaper report about Plastic Pollution. They then looked at the key features needed to make a good report. From this, they were then able to self – assess their cold task from the previous day. In Maths, Year 5 have been consolidating multiplying 4 digit numbers by a 1 digit number. They then moved on to multiplying a 2 digit number by a 2 digit number. Year 6 have been comparing and ordering fractions. It has also been Anti Bullying Week. The children have been discussing and acting out various scenarios. They have also been designing posters to promote Anti Bullying. In Literacy, the children been researching about the effect that pollution has on our oceans, ready to write a persuasive letter. They have written paragraphs about the facts that they researched, and have then edited with a partner, to improve their punctuation, spelling and vocabulary. Year 6 children, have moved on to comparing and ordering fractions in Maths, while Year 5 are looking at different ways of multiplying a 4 digit number by a 1 digit number. In Literacy, we looked at the features of persuasive writing. The children wrote a letter to Mrs Coney, asking for an all – weather track to be put around the field. In Topic, we started to look at Mayan Masks and what they symbolized to the Maya people. The children, also started to design their own masks. In PE, with Mr Curcio, the children started gymnastics and learned different ways of travelling, making pathways around the hall. This week, in Literacy, the children wrote a diary entry related to our Guided Reading book ‘The Explorer’. Throughout the week, we then looked at the key features of writing a good diary entry. In Maths, Year 6 were looking at multiplication and division word problems. Year 5 were looking at subtraction methods to 1 000 000. In Science, the children wrote conclusions about the bread experiment that they conducted the previous week. Our topic of ‘Marvellous Mayan’s’ saw us learning about their writing system. This week, after looking at features of information leaflets, the have finished their own Mayan information leaflet. They used ICT and books to research extra information and printed out images to enhance their leaflet. 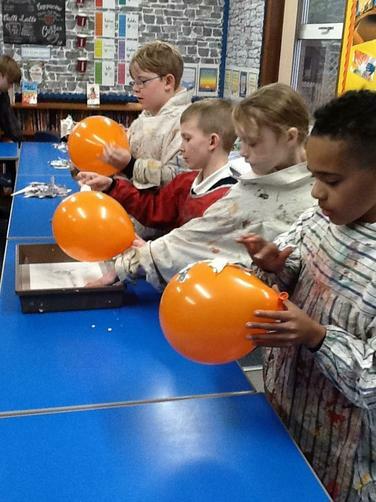 In Science, the children looked at helpful and harmful types of bacteria. They also conducted an experiment to see under which conditions, bacteria grew the quickest. The children were given 2 slices of bread, and they had to decide where to put it (in the light or dark) and the condition of the bread (dry or wet). Both slices were then monitored during the week. This week in Literacy, the children were given a ‘Cold Task’ to create an information leaflet on the Mayan Civilization. They weren’t given any information, except they could use anything that was already in their books so far. Later on in the week, we looked at the key features of leaflets, and what a good one should look like. In topic, we looked further at the Mayan Civilization and what primary and secondary sources are available for us to research about them. The children were given photograph to answer questions from, and attempt to draw the picture themselves. In Science, the children followed on their classification of animals from last week, by creating their own ‘Curious Creature’ to classify using the criteria from the previous week. In RE we explored Trinity, that it is the Christian belief that there is one God, the Father, Son and Holy Spirit. We wrote the memory verse inside the symbol of Trinity and then also decorated some. In English this week, the children have published their Dream World stories and some have word processed them on computers. In Maths the Year 6's have been multiplying by 2 digit numbers and the Year 5's have been rounding numbers. The children were introduced to the Mayan Number System during topic this week, and to work out some number problems. In Science, following on from last week, when the children were classifying species of animals the children used the Linnaean System to classify animals further. We explored the symbolism in Christianity. We started the lesson by discussing the symbols we have in our everyday lives before matching the Christian symbols with their explanation. Which symbols do you recognise? This week, we researched a bit more about the Maya tribe and produced our own information page. We also looked at some of the Gods the Maya worshipped and talked about how the Priests influenced what went on in Mayan culture. In English this week, the children were drafting and editing their Dream World stories. In Science, we looked at classification and how taxonomists classify species of animals. The children were given a task where they had to classify species together so that they would be housed in a zoo safely and in the appropriate enclosures. We started our topic off, with the children doing a knowledge harvest. They wrote down what they already knew about the Maya and then wrote down questions that they would like to find out throughout the topic. We were then introduced to the Maya tribe. We found out where they originated from and how long ago they lived. The children labelled maps to show where the Maya settled. In English, the children have been planning a story based around their Dream World stories.